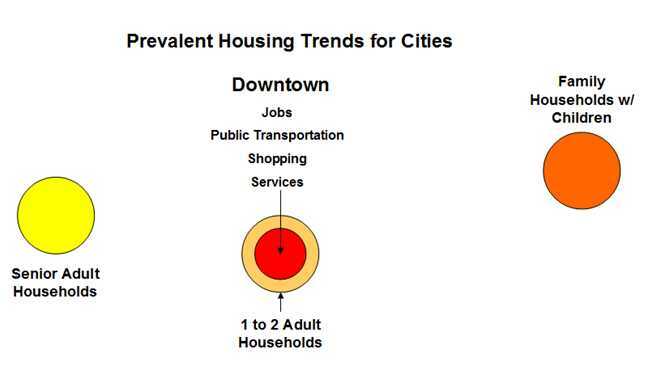 Note: This blog post is being written from a U.S. perspective for U.S. cities. We do realize that much can be learned from other countries. A growing number of reports indicate that some demographics, especially seniors and millennials, are interested in moving back to the city centers. Other reports promote the benefits of such "hot topics" as: increased densities, mixed-used, transit oriented developments, etc. A Personal Transportation Hub is a shared resource for a group of people. The resource being shared is various transportation vehicles. These could include cars, bikes, scooters, and "electric vehicles" (more on this later). This idea is inspired by some reports indicating that millennials are more interested in renting than owning. 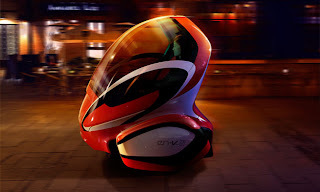 With this train of thought, more compact developments could gain space and cost savings by creating a Personal Transportation Hub of shared vehicles. The Personal Transportation Hub would be for members only. The members could reserve and check out any vehicle that is in the Personal Transportation Hub. Consider, for example, a cohousing development with 40 to 100 units. Traditional design would indicate that 1-2 parting spots are needed per unit with some spaces for visitors. With a Personal Transportation Hub, car sharing could reduce the number of parking spaces per unit by eliminating the need for a second car, or in some cases, their primary car. Thus, there would be space savings, as well as cost savings to residents without the worry of car maintenance or insurance. If managed well, the Personal Transportation Hub could provide the members access to specialty vehicles such as a pickup truck for home chores or a convertible sports car for date nights. Hopefully, each member would indicate their destination to allow others to see this with the hope of encouraging car pooling. For example, consider when someone is going to the grocery store. A senior Personal Transportation Hub member who can no longer drive may be very appreciative of this car pooling opportunity. Consider again a cohousing development with multiple generations. Considerable space is needed to allow everyone to store their personal adult bikes and especially the kid's bikes. At any one time, only a fraction of the bikes will be in use. Replacing the individual bikes with bike sharing stations will save garage/storage space for the housing development as a whole. Borrowing from European experience, it would seem that as U.S. cities become more compact that scooters will become more and more acceptable to use. Scooters would then be a natural component within the available transportation options. The "electric vehicle" inclusion would require changes to our transportation infrastructure as the "electric vehicle" we are referring to is a golf cart. 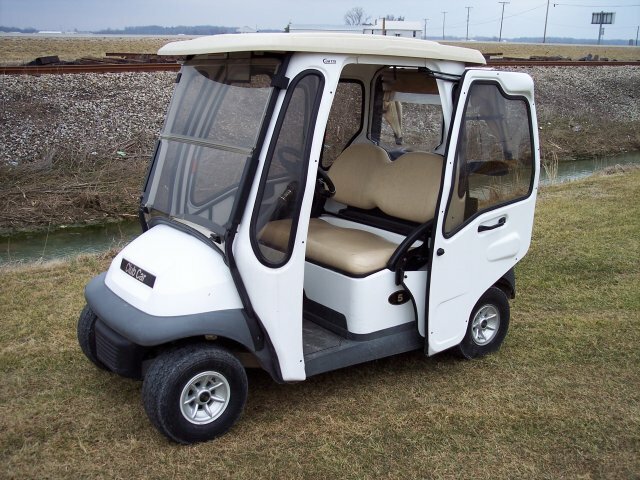 Compared to a gasoline powered car or the new hybrid and fully electric cars, golf carts are inexpensive. The golf carts are also smaller, so it will be easier to find parking than a full size car. The idea is that the golf carts could be used for short trips by a person that is not physically able to use scooters. Consider a senior going to a doctor appointment or grocery store or a mother with kids going to a park or museum (safety improvements would probably be needed for the kids to be passengers in the golf cart). Currently, U.S. roads do not allow golf carts. 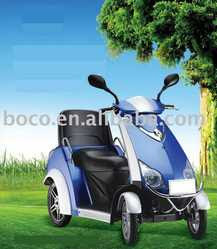 The thought is to change current regulations and designs so that the golf carts are allowed. For example, consider a Complete Street-like design. Another, option to consider for retrofitting existing city infrastructure is to convert a road that has one lane in each direction. These roads could easily be converted to have 1, one-way lane for cars with the second lane being dedicated to alternative low-speed vehicles such as the golf carts, low speed scooters, and bikes. Hopefully, these alternative vehicle lanes would be safe enough so that families could also use them for bike riding with young kids. A consideration with golf carts is inclement weather. 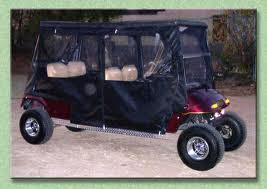 One low cost option is a clear plastic "tarp" (specifically designed for golf carts) that goes over the golf cart. This can minimize the effects of rain, but is not overly "pretty" looking and does not help with more sever weather. 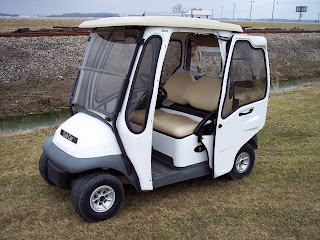 Doing an internet search, the below hard shell golf cart was found. It this becomes popular, more options would likely become available. For a properly designed city, essential services such as doctor offices, grocery stores, parks, museums will be in relatively close proximity to where the people live. Thus, the golf cart should be able to easily reach these locations with a single charge. Never-the-less, an associated idea is to put charging stations around town at key locations such as senior centers and parks. The idea is that the city or a private group would pay for the cost of the charging station. Each user would pay for the electricity that they use plus a "connection" fee to help pay for the operating costs. For example, $1 connection fee + 10 cents per kWHr (market rate where we live). Hopefully the local government would be reasonable about the cost. As a reminder about trying to make the transportation more sustainable, having a solar panels attached to the charging station would be a nice option. The charging stations would hopefully have connections for many types of devices from electric cars to golf carts to computers to hand held electronic devices. This should increase the station's use and shorten the payback period. Senior housing is usually separate from where families with kids live and yet, seniors and families share surprisingly many common housing and environment design needs1. Living in the city has advantages such as jobs, transportation options, shopping, parks, entertainment, and services. Unfortunately, the seniors and families typically live outside the urban center and miss out on the urban advantages. The goal of mix-generational housing is two fold: design for the youngest to the oldest resident to live in close proximity to each other and the urban center. Our first proposal is that there appears to be benefits by co-locating the seniors and families with children. Instead of duplicating services in multiple parts of town, services would be consolidated in one location. The APA briefing paper2 reports that the AARP research has shown that seniors do want to live closer to younger people. From a business case perspective, in addition to the cost savings by combining the similar services, demographic data is indicating that seniors and children will compose almost half of the population in the upcoming years.3 Thus, there should be a good financial case for co-locating the seniors and kids. To gain additional synergies, such as restaurants that serve the business crowd during the day and the families in the evenings, our second proposal is to locate the mixed-generational housing within the downtown or in close proximity. This will reduce the commute time for the family income earners thereby freeing up more time to spend with the family, creating stronger families. This location choice ties into the growing movement of walkable, transit-oriented communities with the live-work-play mentality. The first observation came from a senior focus group. Their comments were that if you design the city for the seniors, you will accommodate everyone else as well. We believe there is significant truth in this perception, but that it is not completely accurate. For us, it seems as though senior-oriented design will result in maybe 80% of family needs being met. For example, seniors can probably be comfortable with a 1-2 bedroom unit. However, families with more than one child will need 3-4 bedrooms. With some foresight and additional planning, senior design can also include the families with children. This should accomplish about 95% of the total design. The last piece to add is the support for singles and couples, which should be a relatively small step to take once the seniors and families are adequately supported. The second observation has come from trying to research family-friendly cities and more specifically family-friendly design standards. A prominent west coast city undertook a commendable effort to create family-friendly housing. However, a young couple could not find an adequate three bedroom family unit downtown. For example, they said that the size of the children's bedroom was not big enough for a bed and that to them, it seemed more like a home office. Thus, proper design standards are imperative to make sure that developers create housing that will truly meet the needs of the intended residents. The Human Life Project® has created a vision for a "multi-mixed" housing design concept. Principally, mixed-generational housing offers both senior units and family units. The design concept is very flexible, and can include mixed-use with businesses and supporting services. Preferably, it would be mixed-income as well. Our designs do support efficient use of space and other principles that can lead to cost effective housing as well as adding of amenities for the higher end residents. Another goal is to also include multiple transportation options (mixed-transportation), encouraging walking, bicycling, and public transit. We envision a number of benefits for this type of design. The first benefit is aging in neighborhood. The concept is that as the person's state in life changes, they can move a very short distance to a more appropriate house. A single young adult may start with a 1 bedroom unit. Once married, they can move to a 2 bedroom unit. As family size expands, the family moves to the larger 3 to 4 bedroom units. Finally, when the couple becomes empty nesters and no longer want to deal with stairs, they can move to one of the ADA assessable units. The concept is that all of these units could be within the same building structure. Consequently, as a person's state in life changes, they have the option to stay in the same neighborhood and retain friends, favorite restaurants, grocery store, bank, place of worship, etc. The topic of "aging in place" seems to be gaining momentum. We actually would like to dissuade this because of a couple of observations. Aging in place principles would require that the larger family units incorporate ADA accessibility features so that as the parents age, they can still function well. Instead, aging in neighborhood is encouraged. Our proposal is that the ADA features would only be in the senior accessible units, which the person would move to as physical condition changes. Thus, they could cash out some of the equity from larger family unit, move to the smaller assessable unit, and use this extra money to help fund their retirement. The larger family unit is then passed along to the next generation of families with young children. This is a more active approach to addressing generational housing needs rather than stationary. Another observation in the progression of cities over time is how young families initially move close to schools and then remain in the same house many years after the children graduate. In our town, this has resulted in school neighborhoods with few children. However, housing options are limited for seniors to move within the city. Thus, families with the young children are often forced to live remote from the schools. We think that our proposed design will allow the continual influx of families with young children so that the school enrollment can be maintained. Another anticipated benefit is for the formation of neighborhood social networks. We are hoping that the design will encourage a high degree of social interaction between the residents which will result in the neighbors helping one another. For example, the family may check in on a senior periodically. The senior could call upon the family once in a while for help with small tasks. The senior in turn can occasionally watch the kids when the parents need to go somewhere. I would be interested in feedback (scottranville@humanlifeproject.com) on this topic. What do you think of the two main proposals? What is the best way for implementing mixed-generational housing? We are guessing that a combination of "push" and "pull" will likely be needed. Our observations so far is that the concepts are more accepted at the comprehensive plan level for a city rather than changing municipal codes. Thus, some "push" will be needed to encourage cities to change zoning and public policy to move in a direction of uniting the generations within the city by addressing specific housing needs for seniors and families with kids. However, cities do not seem to be in the position to mandate this type of design to developers. 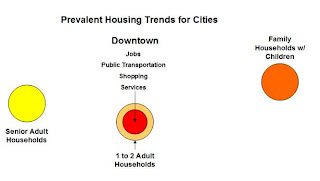 On the flip side, urban planners and architects working with developers are in a great position to do some "pulling" to start proposing and implementing multi-generation housing to show feasibility, desirability for residents, and profitability. 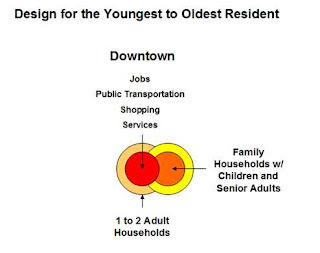 The following quotes are from the American Planning Association briefing paper, “Multigenerational Planning: Using smart growth and universal design to link the needs of children and the aging population,” http://www.planning.org/research/family/briefingpapers/multigenerational.htm.